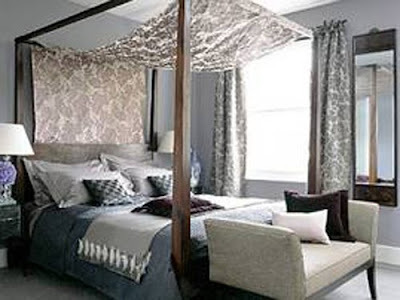 There's nothing like a four-poster bed to add theatrical impact to a bedroom. Here we've chosen a bed with a simple frame and partnered it with rich silks and velvets in violet, grey and taupe with touches of deep purple. Mirrored bedside tables add to the sophisticated feel, while the bench and mirror echo the subtle, oriental lines of the bed.